And with those words, my friend Rosalie and I entered the house with 25 other folks. It was hard to know where to begin, but after a cursory glance around the living room I went upstairs. In the bedrooms, stuff had been pulled out of the closets and drawers and dumped on the beds or the floor. It was all rather sad. Felt disrespectful. But I got a hold of feelings and starting pawing through stuff in the first room. The closet was a bust. Empty shoe boxes, hangers, a handful of mundane clothing. Nothing remotely interesting. The bed was covered in bags and didn’t look too promising either, but I opened a paper bag and found a pristine, ceramic, artisan-made honey pot. Hmmm. That’s quite nice. And a white garbage bag held a HUGE (20″ by 45″) handmade needlepoint scene. Well, well, well. I could see someone using this as a bench cushion. Into my bag they go. 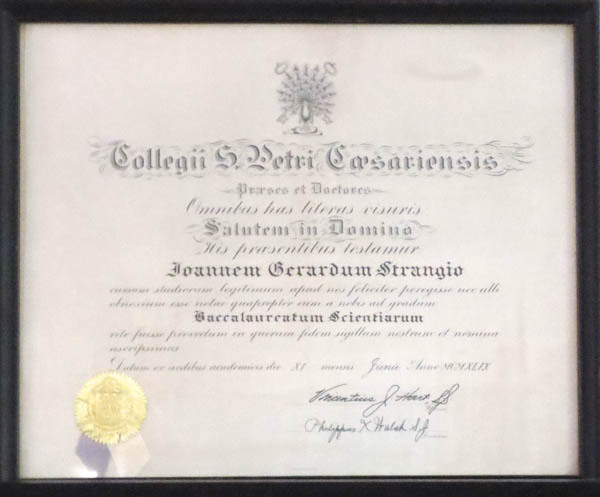 But my favorite find of the day, the one that I almost missed and all the other folks passed up, was right in plain sight in the living room by the front door …a very cool framed 1949 diploma written in Latin. Jeez I love this kind of thing. I may have to keep this for a bit. So in the end, though this estate sale was not pretty, it turned out quite good. A real treasure hunt. I bought seven things and I did get a really good deal!! (Thank you Amanda.) 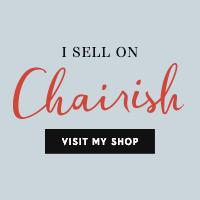 And for my dear friend Rosalie, next time I promise to bring you to an organized, pretty sale!